E XC L U S I V E LY D E S I G N E D BY S I M O N E B I L E S ! C LAURIEâ&#x20AC;&#x2122;S MINI DUFFLE GRIP BAG L1114 : Laurie Hernandez 15 cm x 30 cm purple nylon gymnast grip bag with black woven handles featuring swirl heart imprint on both sides. E XC L U S I V E LY D E S I G N E D BY L A U R I E H E R N A N D E Z ! LENGTH OF PALM To size your hand for GK32, measure from the base of the palm of the hand to the base of the middle finger. LENGTH OF PALM To size your hand for GK56 & GK57, measure from the base of the palm of the hand to the base of the middle finger. Pair of white stretch terry wristbands to protect your wrists when using grips. One Size Fits All. Magnesium carbonate gym chalk is stocked by the pound in eight 2-ounce blocks. SIZING & MEASURING HOW TO MEASURE The goal of measuring is to determine the correct size to order for each athlete. Accurate measurements are vital to the proper fit of your athletes’ apparel. To select the correct size, reference the GK size chart below to determine which size best corresponds to the athlete’s measurements. If an athlete’s measurements fall across two sizes, order the larger size. Please make sure that all athletes are wearing fitted workout apparel during the measuring session. Chest Measurement First, measure the chest of the athlete while their arms are down at their sides. Be sure to take the measurement at the fullest part of the chest. Your measuring tape should always be parallel to the floor while taking the measurement. Waist Measurement When measuring the waist, wrap the tape at the natural waistline which is the narrowest part of the waist. If you are having trouble locating the natural waist, have the athlete bend to the side. The natural waist is where the body bends. Again, the measuring tape should always be parallel to the floor while taking the measurement. Hip Measurement Take the hip measurement at the fullest part of the buttocks with the athlete’s feet together. Ensure that the tape measure is parallel to the floor. Torso Measurement Take the torso measurement from the center of the shoulder, down the torso, through legs, and back to the shoulder. This is the most important measurement you will take when measuring athletes. Inseam Measurement Take the leg inseam measurement by running the tape from the crotch to 2.5 cm above the floor. Measure the athlete without shoes. 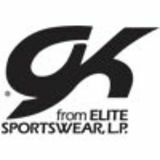 Copyright © 2019 Elite Sportswear all rights reserved. No part of this catalog may be reproduced or transmitted in any way by electronic or mechanical form, including photocopying, recording or any information storage/retrieval system, without the written permission of Elite Sportswear, except where permitted by law. Every champion LAURIE was once a HERNANDEZ beginner who COLLECTION didn’t give up. E XC L U S I V E LY D E S I G N E D BY LAURIE HERNANDEZ! Available through August 4th, 2019 based on stock availability.